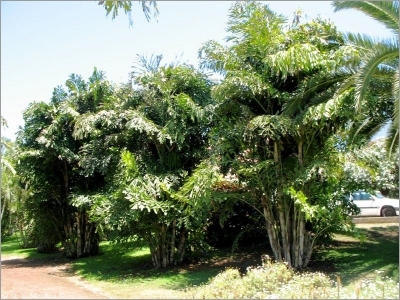 The Clustered Fishtail Palm is probably the most widely grown of its kind, and for good reason. This foliage plant germinates and develops quickly, becoming an attractive, bushy, medium-sized palm, sporting many dark green, bipinnate leaves with fishtail-shaped leaflets that are unique to Caryota. C. mitis is native to Southeast Asia. It is a well-tested, easy-to-grow, and really reliable palm, and will grow in nearly any frost-free climate from warm temperate to tropical.